I have to be honest about something. I don't normally use cleanser. In fact, I just don't wash my face at all, unless I'm using my trusty Clarisonic (and even those occasions are few and far between). Well, color me surprised, because the latest addition to my must-have list is CeraVe Hydrating Cleanser. During my recent facial at Face Place, Tom asked me what cleanser I used. "None," I replied a bit sheepishly (I always feel guilty saying that to a facialist). Tom didn't judge me one bit, but after examining my skin and noticing how dehydrated it had become, he suggested that I pick up a bottle of the CeraVe Hydrating Cleanser, claiming it would bring moisture back to my skin that even the most hydrating moisturizer couldn't. To date, I've been using CeraVe Hydrating Cleanser for one month. My skin still feels as soft and smooth as it did after two weeks, even after frequent plane travel, a summer cold and constant shift in indoor/outdoor temperatures. My skin has honestly never looked or felt better than it does today, AND it's clearer. My nose, which normally boasts tons of unsightly blackheads, has nary a clogged pore in sight. Skin changing? I'd say so. Life changing? Definitely. 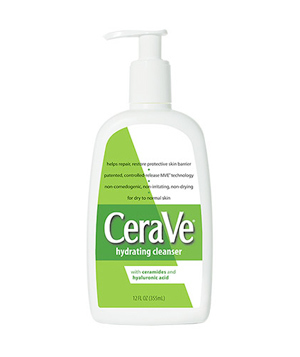 CeraVe Hydrating Cleanser retails for $11.99-$12.59 at drugstore.com. Great to know. I'll be needing a new moisturizer once I run out of my current one, which will be very soon.